Made in the USA! Made to Order. Allow 1-2 Week Build Time before item Ships. 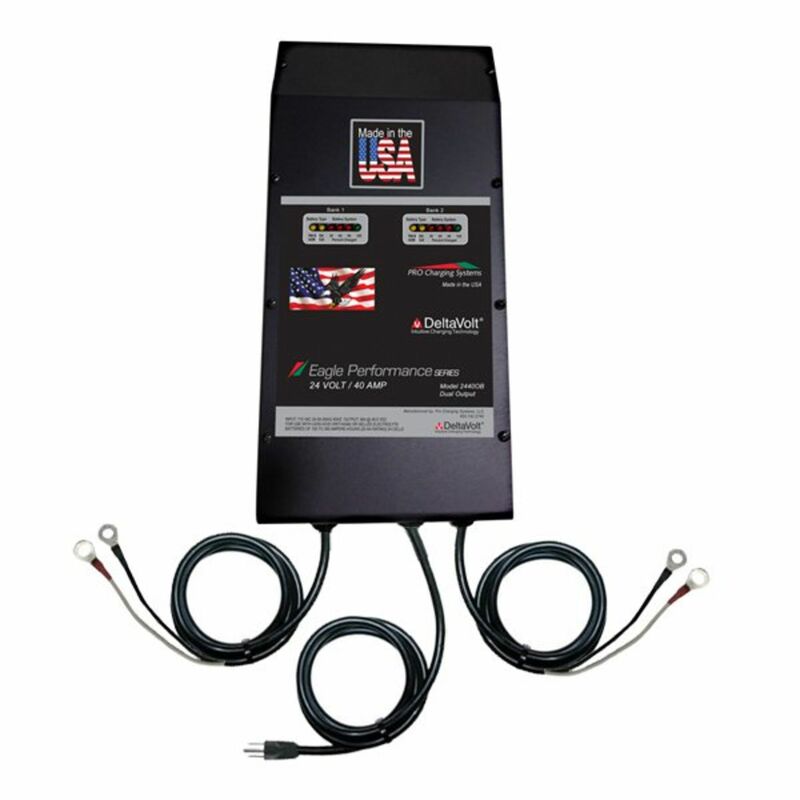 The Eagle Performance i2440OB is a dual 24 volt 20 amp charger, and is meant for tough and rough applications. For any heavy duty 24 volt system or 48 volt systems charging via dual 24v 20 Amp outputs. The Eagle is setup to charge efficiently and reliably every time in industrial applications. The i2440OB has an integrated microprocessor to make sure that you never have to worry about overcharging your battery system. The Dual Pro Eagle Series chargers has 5 LEDs indicating battery charge level for each bank, and when batteries are fully charged the Eagle Charger turns off completely. Should the batteries discharge to a programmed voltage level the Eagle Charger automatically reactivates the charge circuit and bring the batteries back to 100% charge. Eagle Chargers use a proprietary method of adjusting charge algorithm to compensate for temperature thus improving battery charge quality and safety. Forklifts, and other Industrial Applications. Made to Order. Allow 1-2 Week Build Time before item Ships. Do you own the i2440OB? Please, tell us what you think about it. It helps us provide you with better products. Please note that it may take up to 72 hours for your review to appear.